One of my guilty pleasures is watching cookery programmes on television, even if, as a vegetarian, I’m not likely to cook many of the recipes myself. I’m spoilt for choice at the moment and this week I’ve been watching Celebrity Masterchef, Lorraine’s Fast, Fresh and Easy Food, Hairy Dieters and I’ve recorded the Great British Bake-off to enjoy tomorrow. I’ve been inspired this week to attempt pesto sauce. The opening scenes of Lorraine’s Fast, Fresh and Easy Food showed a quick recipe for pesto and on Celebrity Masterchef there was a challenge to produce pesto, without the guidance of a recipe, using a pestle and mortar. So, I checked for a recipe, dug my pestle and mortar out and set to. On further investigation I found that the name pesto sauce is derived from the Italian for ‘to pound or crush’, so a pestle and mortar is the best option for authenticity. The first problem I came across was that my mortar was too small. (Okay, I admit it – I had to check online to see which bit was the pestle and which bit was the mortar!) I was only making enough pesto for two people, but I couldn’t get it all in. I relectantly had to decant to my mini food processor. The smell when making it by hand was amazing though. Perhaps I need to invest in a larger pestle and mortar. 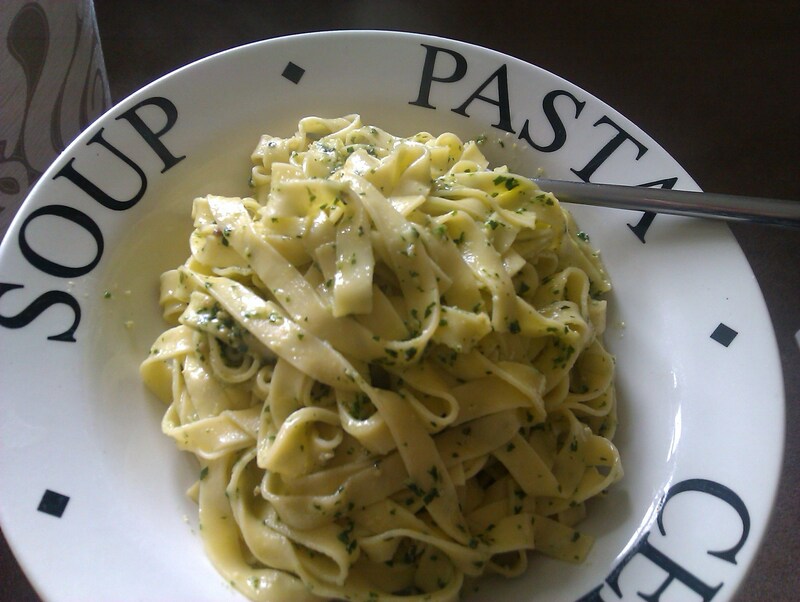 Traditionally pesto sauce contains parmesan cheese. Parmesan is not vegetarian. I recommend getting some Twineham Grange Vegetarian Pasta Cheese from Bookham Fine Foods, which is an excellent substitute. There’s an interesting article from the Guardian, No parmesan please, we’re vegetarian, about the issues surrounding parmesan cheese and the fact that it is not suitable for vegetarians – definitely one to keep an eye on when eating out. You need to prepare all your ingredients first, so you have them ready, Blue Peter style to add them on demand. I promise you, I wouldn’t say this if it wasn’t necessary – it’s not my style to be organised in the kitchen, but here you need to be. First of all, gently toast your pine nuts. Keep an eye on them and don’t let them burn. Grate your vegetarian hard cheese finely and tear the basil leaves up. If you are making this in a pestle and mortar, mix ½ clove of garlic with a generous pinch of course sea salt. 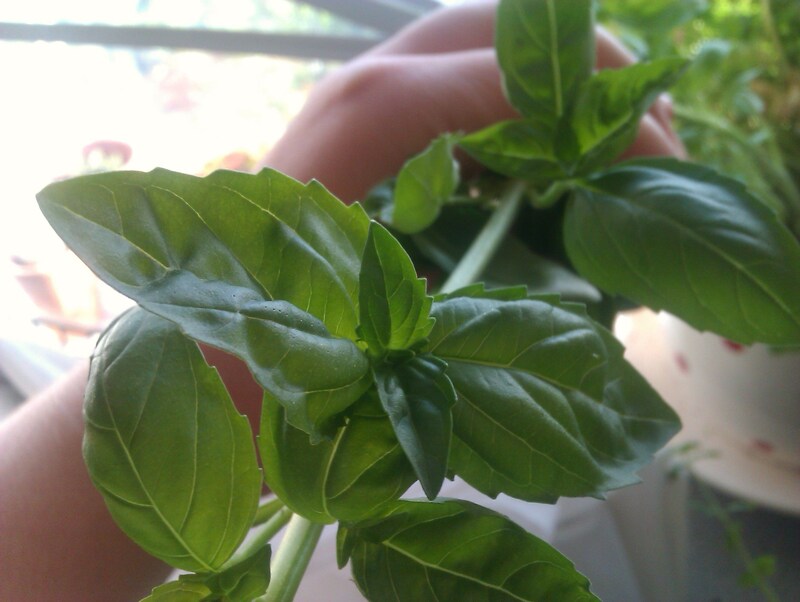 Add in the basil leaves and 50ml olive oil, a spoonful at a time, and muddle together. Mix in the vegetarian parmesan-style cheese and the toasted pine nuts. Work into a lovely fragrant paste. 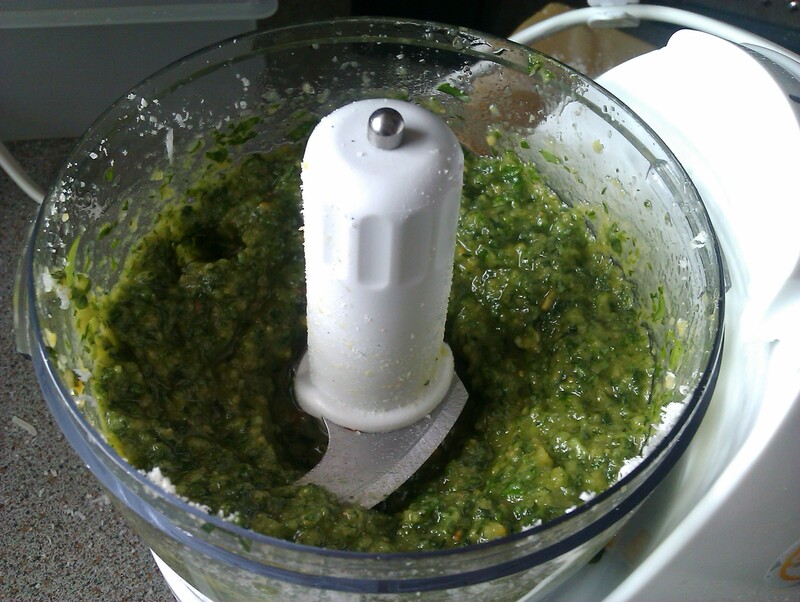 If your pestle and mortar are just too small, you can whizz everything up quickly in a food processor. This is, of course, lovely served with pasta.